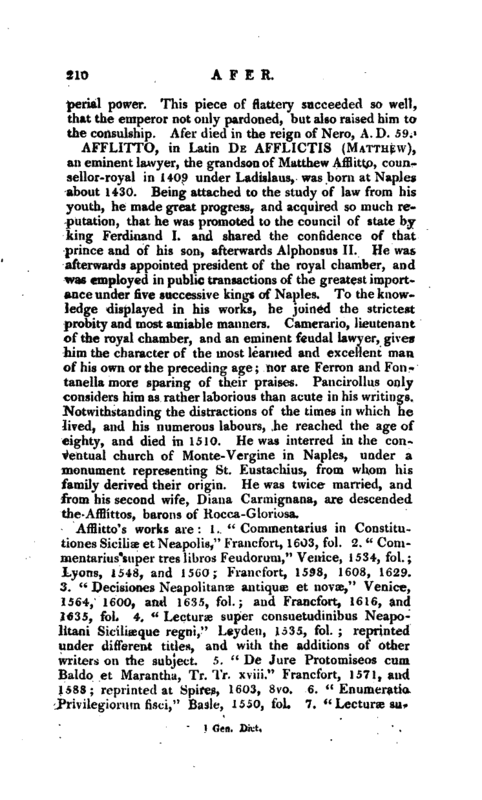 , an eminent lawyer, the grandson of Matthew Afflitto, counsellor-royal in 1409 under Ladislaus, was born at Naples about 1430. Being attached to the study of law from his youth, he made great progress, and acquired so much reputation, that he was promoted to the council of state by king Ferdinand I. and shared the confidence of that prince and of his son, afterwards Alphonsus II. He was afterwards appointed president of the royal chamber, and was employed in public transactions of the greatest importance under five successive kings of Naples. To the knowledge displayed in his works, he joined the strictest probity and most amiable manners. Camerario, lieutenant of the royal chamber, and an eminent feudal lawyer, gives him the character of the most learned and excellent man of his own or the preceding age; nor are Ferron and Fontanella more sparing of their praises. 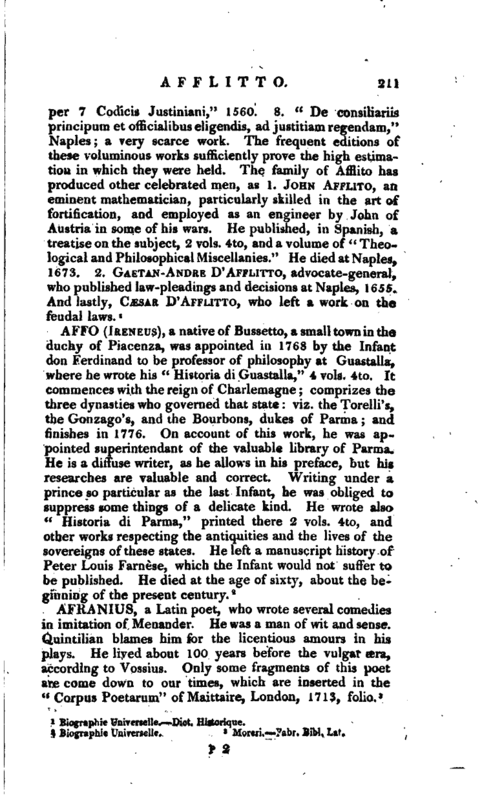 Pancirollus only considers him as rather laborious than acute in his writings. Notwithstanding the distractions of the times in which he lived, and his numerous labours, he reached the age of eighty, and died in 1510. He was interred in the conventual church of Monte-Vergine in Naples, under a monument representing St. Eustachius, from whom his family derived their origin. He was twice married, and from his second wife, Diana Carmignana, are descended the Afflittos, barons of Rocca-Gloriosa.